Is is still Sunday? Hope so. Today (tonight)’s post is a recipe. I never thought I’d make recipe posts, but I suppose you never know. Mother’s not one to write down her recipes. She makes them all in her head…then just…you know…makes stuff. You know? I don’t. I love following recipes. With painful exactness. Nope, won’t be a chef. I can never come up with things on my own. 2. Grease baking dish with butter. 3. Slice bananas lengthwise twice, cutting bananas into three slices each. 4. In a small bowl, sift the two teaspoons of sugar with the cinnamon powder, set aside. 5. In a separate bowl, mix all dry ingredients (minus cinnamon and sugar mix). 6. Add the wet ingredients to the dry, and stir until well moistened. 7. Pour batter into the greased dish. 8. Place the banana slices on top. 9. Sprinkle the cinnamon and sugar on top. 10. Bake at 350˚ for 35-40 min. until browned on top. *Ingredients in parenthesis can be substitutes in order to make recipe vegan. Hope you try it out some time. It’s a great recipe for when you have really ripe bananas, but lack the urge to eat them. Make banana bread – cake! Previous Article Toadally Doing This. Next Article I’m Happy, and I Snow Why. Thanks for being there for me to share with, Tania. 😀 Thank you. Hope you enjoy! That photo is mouth watering…I love banana anything. Thank you for sharing your recipe. That photo is so excellent, I can almost SMELL it from here. Looking forward to trying it. Thanks for sharing. That looks AMAZING! I will try soon. Drooling! Yay! Hope you enjoy the results! True! Thanks (: It was actually the photo that spurred me to write this post. Yummy! I love banana bread, I'll have to try this. Great photo! I love how you can see all the tiny banana seeds! 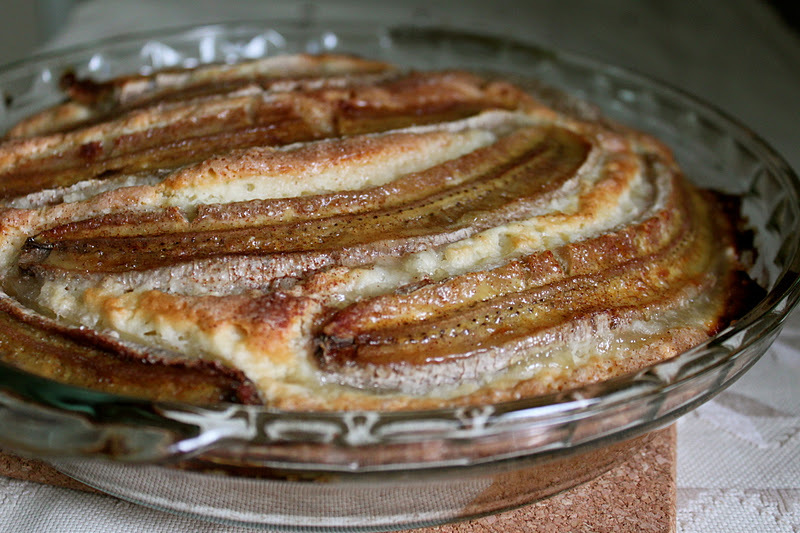 Great use for over ripe bananas! Sounds delicious, and I'm always looking for new recipes:) Thanks for sharing! Wow, Larissa – so pretty! I love that cinnamon is in this recipe…and that your mother made it up. Beautiful!